with lunch break 12:30 to 1:30 each day. Thursday 9 am to 1pm. Shooting Stars and Rising Stars will be hosted by one of the STAR Camp assistant coaches. Coach France will assign athletes to their divisions, and the staff will move athletes around until they are in the appropriate division. Only $179 for Magna Vista & Laurel Park athletes! $189 for athletes from other schools! Approximately 20 Shooting and Shining Stars division. Approximately 25 in the Shooting Stars division. Approximately 25 in the Rising Stars division . The 2019 camp registration form is here! Pictures from the 2010 and 2018 camps are on Facebook! They are here! We will start the camp in separate divisions working on the girls' skills to ensure all the athletes can serve, pass, hit and dig properly. Throughout the camp, setters will get a lot of time working with coaches who specialize in setting. On the 2nd day, competitions will begin which emphasize the skills of the game. On the 3rd day, teams will be created in each division to get ready for the Thursday tournament. For the final few hours on Thursday, athletes and parents wil love watching the tournament!! Hannah has played 4 years as an OH at Averett University. Each year she has been named 1st team All-Confernece. In all four years, she's been one of the top three hitters in all of NCAA D3. She has been named USASouth Conference Player Of The Year as a soph, jr and senior! Hannah is a 2014 graduate of Dan River High School, near Danville, Va. She played 6 years of school vball and 5 years of club vball. She played on Coach Houser's team in 2012 that attended Jr Nationals in Columbus Ohio! She was named 1st team all state her senior year at Dan River. You can see an article about her college feats here! You can contact Hannah at hannah_shields3@yahoo.com ! Kelsey played on the Roanoke College volleyball team for 4 seasons. She graduates in May 2019 with a degree in Math. Before college, Kelsey graduated from Midlothian High in Richmond in 2016, where she played volleyball for 6 years. She also played 7 years of club volleyball. You can find out more about Kelsey here. Kelsey has worked 23 STAR camps the past 3 summers. Her sister Amy is playing at Eastern Mennonite University. Both Kelsey and Amy were regular participants in the Expectations Camps at Sweet Briar! You can contact Kelsey at kelseygoodman3@gmail.com. Sydney played 2 seasons on the Danville Community College Knights volleyball team. Before that she played at Gretna High School for 5 years, where she also was a star on the softball team. Sydney graduated from Marshall University in May with a degree in Public Relations with a concentration in Sports. She has worked 26 STAR camps the last 4 summers. You can contact Sydney at swshelton97@gmail.com! Catherine is a senior at Lord Botetourt High School. She has played 6 years of school volleyball, and is playing her 6th year of club volleyball. Her varsity team at LB just finished the season as repeat 3A state champs!! She was a member of Coach Houser's 15's team in 2015 that was the #1 ranked 16's team in the ODR. In both 2016, '17 and '18, she has played on the top team for Roanoke United. You can contact her at CatherineReinard@gmail.com!! Ashlea has completed one season at Patrick Henry Communityh College on their volleyball team. She is a 2018 graduate of Patrick County High where she played DS & Libero. She played 5 years of high school volleyball as well as 5 seasons of travel. She also played softball for 8 years. including travel & school. She has been working volleyball camps for elementary age kids at her PCHS since 2015. In the spring of 2018 she coached Southside 12s! You can contact Ashlea at AshleaHavens@gmail.com! Cameron is 2019 graduate of Bassett High and will be playing at Guilford College in the fall. She has played 5 years of school vball & 7 seasons of club vball. She holds her school record of 19 stuff blocks in a match! She is most proud of receiving the Player's Choice Award "Does/Says the Right Thing" on Coach Houser's 15 National team in 2016. You can contact Cameron at cameronlblankenship@gmail.com. Ashley will be a junior next fall at Bassett High School. She has played 3 years of school vball and 4 years of club volleyball. She has played OH, right, MB and setter. She has attended the 2017 STAR Camp at Patrick Henry Community College. This is the 2nd STAR camps that she ha assisted with. You can contact Ashley at A.E.Minnick1@gmail.com! "Thanks so much!! I had a blast this week and I learned so much. Thanks for coming and taking the time to teach us. It’s feels great to be the tournament champs!" "Fantastic pics! She says she had a great time. Thanks to you and your team. Got any good pointers for me to share with her?!!" Touch here to see the school website. According to NCAA rules, graduates ARE eligible to participate in a summer high school camp. This will not get them in any trouble and it will not jeopardize their college volleyball eligibility. If anyone is interested in some one-on-one training. Coach Houser and his staff offer player training nearly every Sat & Sun night in Roanoke. Girls come from West Virginia, Pulaski, Martinsville, Hillsville, Lynchburg, etc. The website is here. It's a TON of fun!! Please put the following on your calendar! August 3 2019 in Danville. August 4, 2019 at North Cross School. For athletes with at least 2 seasons of experience. 2019 information can be seen here. 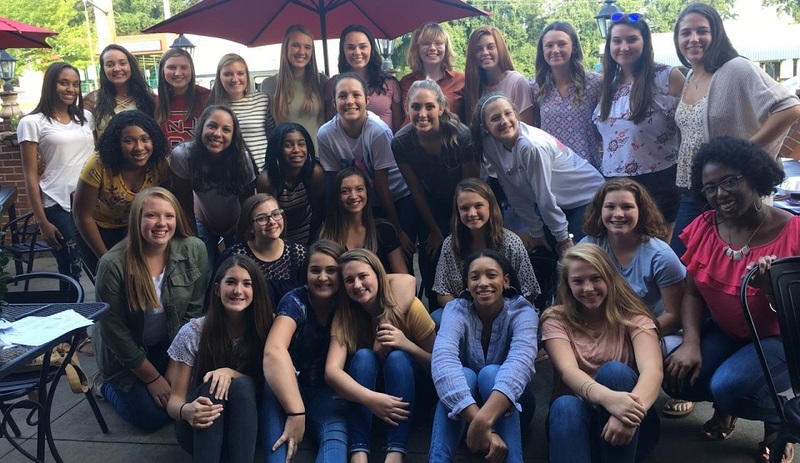 Magna Vista High 2018 STAR Volleyball Camp! Middle Row: Coach Ashlea Havens, Coach Cameron Blankenship, Jenny Turner, Delaney Burris, Elivia Harper, Olivia Jones, Amanda Jones, Peyleigh Willis, Makayla Rumley, Claire Smith, Carlee Ashworth, Danielle Draper, Megan Cockram, Ashlyn Mullins, Millayna Redd, Coach Grayce Dantzler.